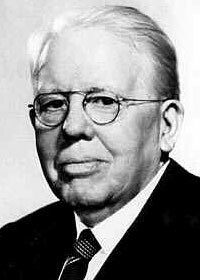 Melvin Jones founded the service club, Lions Clubs International, on June 7, 1917. His stated intention was that Lion's Club would be "Masonry without the apron." He himself was a high-level Mason, having been initiated into the Garden City Lodge No. 141 in Chicago, Illinois in 1906. In keeping with the Masonic 'false works' philosophy, he also believed that, "You can't get very far until you start doing something for somebody else." And, he certainly did do a lot: By 1950, Lions membership had passed the 400,000 mark. Just how many more lives have been led astray since that time? The Lions Club - Is the Lion's Club Satanic? The Lions Club symbol, showing a pair of lions on either side of a gold-rimmed disc, is displayed at the entrance to countless cities across America and throughout the world. In fact, quite the opposite. 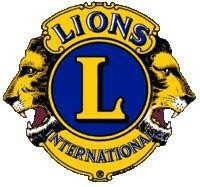 The pair of lions depicted on the logo for the Lion's Club have nothing to do with anything good and holy. Rather, it is an occult symbol for sun worship. "Behold, at the door of the temple of the Lord, ...with their backs toward the temple of the Lord, and their faces toward the east; and they worshiped the sun toward the east..."
The Lions Club logo at the entrance to thousands of small towns and cities serves as a warning that these areas have already been conquered by the 'roaring lion' and his evil false religion. These 'All American Cities' are under the influence of 'lions' - malevolent, controlling spiritual principalities - along with numerous places in the rest of the world. In fact, Lion's Club International has millions of members not only in the U.S, but also worldwide. These evil 'territorial spirits' are thereby able to exert a vast and permeating influence through such organizations as Lions Club, among many others. The official logo for the International Lions Club features two lions facing away from each other surrounding a circle in the center. This logo strongly resembles the symbol for the Egyptian Aker. In Egyptian mythology, Aker (also Akar; plural Akeru) was one of the earliest gods worshiped, a deification of the horizon. There are strong indications that Aker was worshiped before other known Egyptian gods of the earth, such as Geb (Egyptian god of the Earth - the god of the Masonic 'G'?). As the horizon, Aker was seen as symbolic of the borders between each day, and so was originally depicted as a narrow strip of land (a horizon), with heads on either side, facing away from one another, a symbol of borders. These heads were usually those of lions. Aker guarding the entrance and the exit to the Underworld. Aker embraces the world - he is represented as the sign of the horizon in-between two lions (sometimes these may be human forms instead) which are seated back to back (one animal faces west - where the sun (the circle) sets each day and begins its journey into the night and Underworld, the other lion faces the east where the sun rises each morning free once more from the realm of darkness). In ancient times the Lion was the companion of the Goddess (Isis in Egypt). At times it represented her power to destroy and was associated with Ishtar, Astarte, Cybele and Kali. The lion was a symbol of Time, which these goddesses embodied and controlled. Sometimes the lion might be depicted with two heads looking back into the past and ahead into the future. One still sees the two lions of the Goddess at the entrances to buildings where one is the lion of yesterday and the other of today. 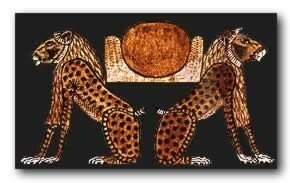 Aker, an ancient earth-god, signifying the horizon, the point where night turns to day, where day turns to night, and therefore depicted as two lions seated back to back, facing away from each other. They are also called 'Yesterday' and Tomorrow', as one lion faces towards the east where the sun rises and begins the new day, the other lion faces west where the sun sets and descends into the Underworld. Aker also guards the gate to the Underworld and opens it for the King to pass through. The area between the lions´ backs often shows the circle of the sun as if rising between two hills. This also signifies the sun´s journey across the sky during the day, as well as it being safely carried on the back of Aker during its dangerous night journey in the Underworld each night. Aker is an earth god who also presided over the western and eastern boarders of the Underworld. In early representations, Aker is shown as a narrow strip of land with a human or lion head at both ends But later he was shown as the foreparts of two opposing lions, sometimes with human heads, facing away from each other. One lion faces west while the other faces east. In between them is the sign of the horizon. In the later period of Egyptian theology the two lions making up the Akeru were named Sef and Tuau - 'yesterday' and 'today' respectively. 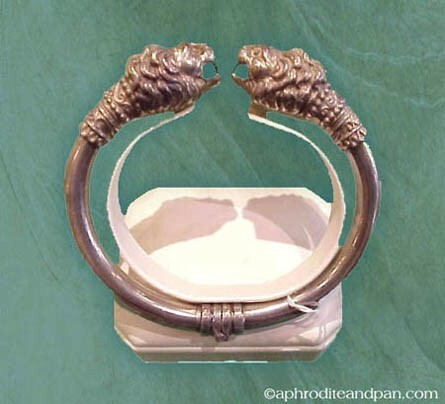 Ancient Egyptian mythologists believed that during the night the sun journeyed through a tunnel that existed in the earth - its entry into the tunnel caused the night, its emergence again bringing the day once more. Each end of this tunnel was guarded by a lion god. Isis is a goddess in the Egyptian belief. She was most prominent mythologically as the wife of Osiris and mother of Horus, and was worshiped as the archetypical wife and mother. AKER is the guardian on either side of the gates at the entrance to the temple of ISIS. Throughout the Graeco-Roman world, Isis becomes one of the most significant of the mystery religions, and many classical writers refer to her temples, cults and rites. Temples to Isis were built in Iraq, Greece, Rome, even as far north as England where the remains of a temple were discovered at Hadrian's Wall. At Philae her worship persisted until the 6th century, long after the wide acceptance of Christianity. Don’t think there aren’t those who still worship her today, whether inadvertently or not. Common cult components of a mystery (Latin misterium) religion include sacred symbols and rites with personal spiritual and magical efficacy, purification rituals that may include abstinence from taboo foods or actions (compare asceticism), baptisms and other initiation rites and sacraments. Mysteries provide a threshold to a beatific vision. The highest promise for the mystai (Greek, "initiates") was the comprehension of the natural life-death-rebirth cycle as it was evoked through participation in a cult's mysteries, and in some mystery religions even a blissful afterlife through salvation, which was conferred by the perennial and redemptive death of a "dying-and-rising" god. ('I will be like the most high' – Satan’s counterfeit). Initiation into the mysteries of a deity might be divided into several stages through which an adherent had to ascend to obtain knowledge of the higher mysteries of a particular cult. Mithraism had seven stages towards ultimate understanding. Aker is an old god from ancient Egypt - he is first mentioned in the Pyramid Texts, and from the passages in which his name occurs is thought that he had a very clear and well defined role in the Early Egyptian kingdoms. In the later period of Egyptian theology the two lions making up the Akeru were named Sef and Tuau - 'yesterday' and 'today' respectively. OSIRIS – God of the Underworld, Lord of the Dead…Sound familiar??? This is none other than Satan himself. ISIS - Throughout the Graeco-Roman world, Isis becomes one of the most significant of the mystery religions, and many classical writers refer to her temples, cults and rites. Temples to Isis were built in Iraq, Greece, Rome, even as far north as England where the remains of a temple were discovered at Hadrian's Wall. At Philae her worship persisted until the 6th century, long after the wide acceptance of Christianity. 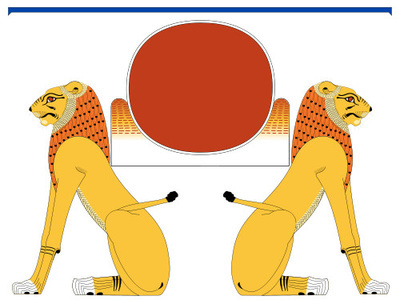 AKER - Aker, an ancient earth-god, signifying the horizon, the point where night turns to day, where day turns to night, and therefore depicted as two lions seated back to back, facing away from each other. They are also called 'Yesterday' and Tomorrow', as one lion faces towards the east where the sun rises and begins the new day, the other lion faces west where the sun sets and descends into the Underworld. Aker also guards the gate to the Underworld and opens it for the King to pass through. Aker embraces the world - he is represented as the sign of the horizon in-between two lions (sometimes these may be human forms instead) which are seated back to back (one animal faces west - where the sun sets each day and begins its journey into the night and Underworld, the other lion faces the east where the sun rises each morning free once more from the realm of darkness). Because the ancient Egyptians believed that Aker guarded the gates of the morning and night, statues of the lion god were placed at the doors of houses and also at tombs to guard both the living and the dead from evil spirits and more earthly foes. These lion guardians were sometimes given the heads of men and women which turned them into a more recognizable form - that of the Sphinx. Lions around the world celebrated World Peace Day on January 24. Click here to access The Lions Policy Statement on World Peace Day. World Peace Day provides an opportunity for Lions to promote world peace according to local customs. A peace rally may be an acceptable method of celebrating in one country; participating in the Lions International Peace Poster Contest may be the preferred celebration method in another country. Peace is that precious objective which, when it exists in the tranquility of one's own mind and heart, can be found in one's relationships with others. By extension, this harmony can result in the tranquility of order among nations. Throughout the world, secular and religious leaders have issued statements of peace at various times. Certain seasons or holidays connote a spirit of goodwill toward all. Even nations in military conflict have abstained from fighting during specific periods to recognize the cooperative and peaceful relationships between humans which can and should exist. Whether the desired goal is the absence of conflict, the proper order of all things in society, harmony in the family or personal inner satisfaction, the goal is PEACE. Furthermore, the pursuit of true peace cannot be fully attained in one area to the total exclusion of other dimensions of our world society. While it is recognized that the striving towards the goal of peace be respected by Lions clubs throughout the world on a regular basis, it is felt that the identification of a specific day will help motivate individuals to renew their dedication to peace within the world. Now, therefore, BE IT RESOLVED that the Board of Directors of The International Association of Lions Clubs requests all Lions Clubs throughout the Association to observe January 24 each year as World Peace Day in ways consistent with local custom and cultural practices. "Celebrate Peace" is the theme of the 2006-07 Peace Poster Contest. Lions clubs can sponsor the program in their community for children in local schools or organized, sponsored youth groups. Students, ages 11, 12 or 13 on November 15, 2006, are eligible to participate. Through the contest, students are encouraged to visually depict their interpretation of the contest's theme. Lions clubs may purchase a contest kit through the Club Supplies Sales Department. A kit must be purchased for each contest sponsored. The contest must be sponsored by a Lions club. “Peace Without Borders” 2005-06 Grand Prize Poster.